This recipe from The Domestic Rebel is for all the Harry Potter fans. 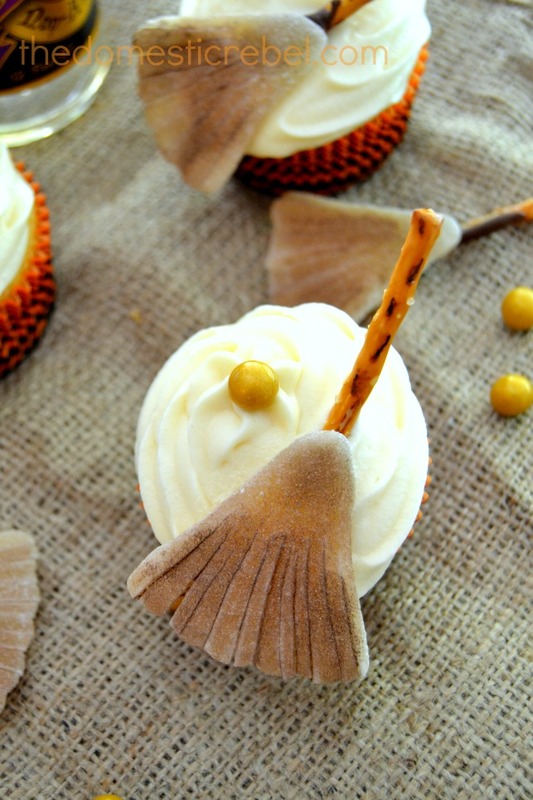 Yes, Butterbeer Cupcakes, you are not dreaming. I suppose I should admit to only seeing one Harry Potter movie but anything with “butter” in the name catches my attention. But even if you’re like me and a Harry Potter virgin, you will still love the rich butterscotch flavor of these cupcakes. You can just call them Butterbeer Cupcakes to impress your friends (or kids!) who are Harry Potter fans. In a large bowl, combine the cake mix and the soda– NOTHING ELSE! Beat with an electric mixer for about 2 minutes or until well combined. Stir in the butterscotch pudding mix. Evenly distribute the batter among the muffin tins, filling about ⅔” full. TO MAKE THE BROOMSTICKS, attach the pointed tip of a grapefruit gummy to a pretzel rod using a little melted chocolate. Let them stand at room temperature to harden. If you’d like a more authentic broomstick look, brush the gummy with edible brown luster dust. If you cannot find grapefruit gummies, gently flatten a banana Laffy Taffy candy with the heel of your hand and cut strips about halfway through the longest side to create the fringe. Wrap the Laffy Taffy around the pretzel rod and secure with chocolate if needed.